As energetic as this opening trek is, the Medici Bros. (“Bros.,” it bears noting, is a misnomer. A single Medici (Danny Devito) serves both roles), the circus has seen brighter days. Holt Farrier (Colin Farrell) returns from war, one arm lesser than before, to major downsizing. His horse act—once the showstopping act of the circus—has been sold away, as has many of his belongings. Holt’s children have held on hopefully, but after the passing of their mother they are desperate for some form of parenting, something Holt appears afraid to provide. Holt’s new act, to his initial chagrin, is the elephants. In particular, he is charged with training the newborn baby of Jumbo the elephant. Unfortunately, young Dumbo’s over-sized ears are the laughing stock of the circus. The narrative of Dumbo comprises a series of cause and effect incidents, the majority of which are executed with Burton’s acute sense of visual panache. For instance, the big first fly moment for Dumbo, a sequence that is bastardized in the film’s trailer, is serviced with adequate “Disney magic.” Other, less extravagant pieces, like Holt and others attempting to calm enraged elephants, look a bit less convincing on a visual effects level. But, by and large, Burton’s execution is successful. His interior lighting is exquisite, and his use of shadows and circus ring staging is compelling. The film as a whole benefits from this, as much of the action leading up to the climax is repetitive. Dumbo is a charming, family-friendly piece that embraces the journey it takes to become a loving and encouraging member of a family unit. It services its Disneyfied requirements without becoming beholden to the more saccharine implications of Disneyfication. What is most fascinating to me, however, is the subversive meta-textual implications of Michael Keaton’s Walt Disney-esque antagonist, V. A. Vandevere. The theme park owner of “Dreamland,” Vandevere orchestrates a strong-armed and shady buyout of Medici’s circus, because he is stricken by the financial possibilities of a flying elephant. In a way, Disney’s villain here is itself. Vandevere is a mustache-twirling, snarling baddie. Keaton drools his lines with a viscous acidity; the exaggeration at work is comical. But his big-business shaker is indicative of Disney as a business. That this film comes out just as the Disney-Fox deal becomes official is, thus, quite strange. The parallels are impossible to avoid. Vandevere buys up the competition, cherry-picking from that company what he needs for his own success and tossing the rest of the intellectual property to the curb. Vandevere has the means to facilitate a crowd for Dumbo, the only IP from Medici Bros. Circus he chooses to adopt, which initially seems like a mutually beneficial deal for both parties. But Vandevere’s only incentive is the bottom line and his desire to monopolize the market. This antagonist could make Dumbo appear sour, distracting from the feel-good story of a family and a baby elephant in search of its mother. But I personally got a lot more mileage out of Keaton’s slimy character with the meta-text in full view. Without it, I may have tired of the repetitive family values theming at play in the A-plot. 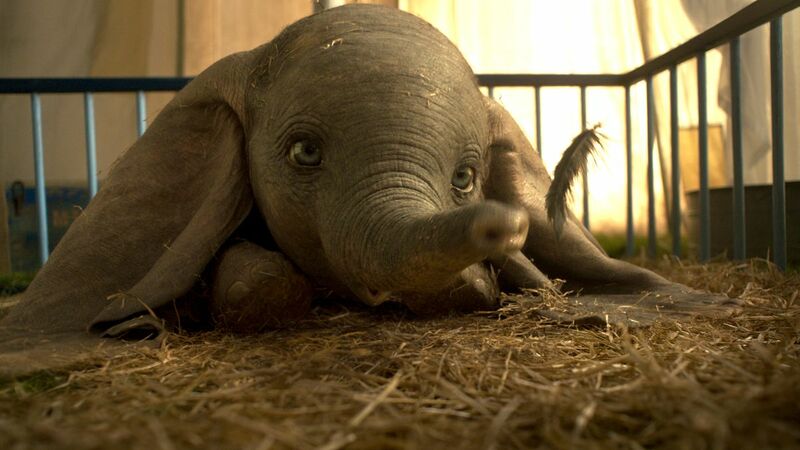 The bottom line with Dumbo is that it is a competent addition to the live action Disney universe. While none of these Disney “reimaginations” have been thoroughly compelling, a handful of them have sufficed. Burton’s addition reaches that bar handily, and it is the most lively a Burton film has been in a decade (if not two).